CALL 800-558-3664 today for your free, no obligation quote. Extend the useful life of your sports court by resurfacing it. Like all outdoor surfaces, game courts will require resurfacing over time. How often a sports court needs to be resurfaced will depend on several factors including usage of the court, weather conditions and more. As with other maintenance projects, preventative and routine maintenance saves time and money. It is wise not to wait for the surface to get too faded or worn out before scheduling the resurface. If cracks have developed, we will check to make sure the court base is stable, then add the surface layers, if needed. This will create a durable court surface that will extend the useful life of the court. Keeping your court surface refurbished will ensure a safer surface for your playing time. Some of the best athletic courts in Southern California have been created and are maintained by Taylor Tennis Courts. Let us create and maintain the game court you’ve been wanting. If you have changes you’ve been waiting to make, don’t delay. Let us help you make the needed changes and improve the consistency of play on your courts. We can plan the project to your specifications, using the latest in new materials and techniques. Let Taylor Tennis Courts resurface and refurbish your courts, whatever the sport. 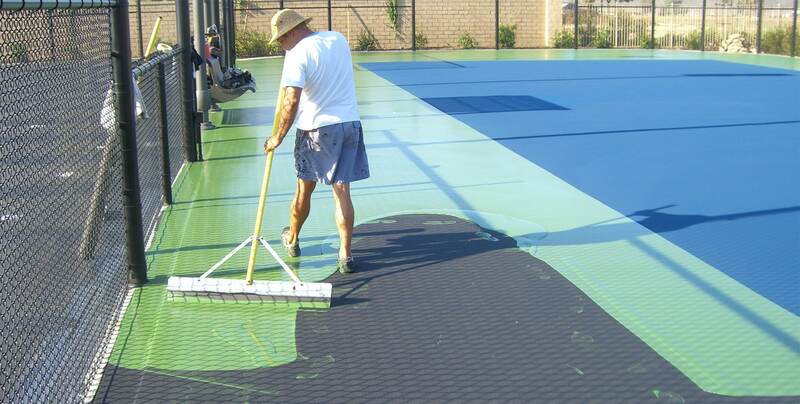 We can repair and reseal the used surfaces of the sports courts you have enjoyed so much. We have 5 trucks and crews out every day resurfacing and restoring sports courts throughout Southern California. Call 800-558-3664 today to schedule your appointment.